What an epic weekend of March Madness, if your bracket isn’t busted you need to go get checked out. 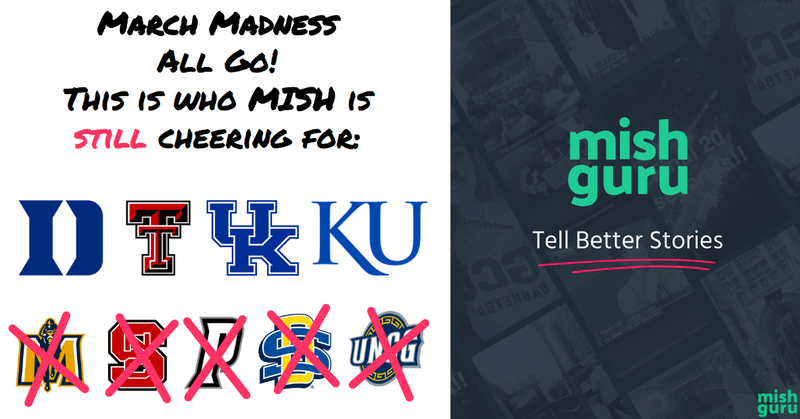 Through all the ups and downs we’re looking at four from Team Mish into the Sweet Sixteen. On the Snapchat front, one of the highlights we saw was Texas Tech getting fan centric with their Storytelling in the quest to find the farthest fan. The Call to Action (CTA) was simple: send us a Snap from where you’re cheering on the Raiders — with a geo-filter to prove it (cuz, you know, nobody likes a cheater) — for a chance to be featured on the Story. Want to chat more about integrating your fans into your Storytelling? Let’s chat.